Key 1990 stat: 275 lbs. 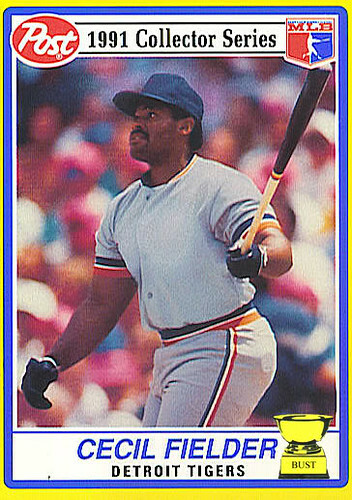 Mmm, Honey Comb: Most people, when first viewing this fine card that came in a box of Honey Comb, think that Post had to remove the team name and logos off Cecil Fielder's hat and uniform. This is not the case. No, you see, this photo from May 12, 1990, was taken at the heftiest of Big Daddy's playing days that season. Upon reporting to the visiting clubhouse in Kansas City before the game that day, Fielder realized his uniform top no longer fit his massive frame. Instead, manager Sparky Anderson had to call Camp Menowannodonuts, the nearest fat camp, and arrange to have a counselor rush over a size XXXL uniform — which, it turned out, was still a little form-fitting on the husky Fielder. A clubhouse attendant hurriedly unstitched the camp logo from the jersey, and an irate Anderson ordered him to remove the "D" from Fielder's cap, as well. "And make sure he doesn't eat the thread!" Anderson barked. But Fielder's embarrassment didn't end there that day. During a fifth-inning at-bat, the slugger took a monster cut at a Bret Saberhagen fastball. The ball went flying — and so did three of the buttons on Fielder's tent-size uniform. As seen on this card, Big Daddy was forced to play the rest of the game using just one button and a safety pin.